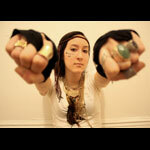 Sweet and soulful, edgy and lyrical, Lisa Jaeggi mixes folk, hip hop, soul and pop. A well-worn voice and guitar provide the means of expressing poetic narratives, city observations and love songs a la Ray Lamontagne, Lauryn Hill and Citizen Cope. Adron is the eponymous debut and stage moniker of twenty year-old Adrienne McCann. Influenced by late ‘60s Brazilian Tropicàlia, Adron has infused her debut with an international texture and a remarkably vintage sound. She adds to her songs a unique array of embellishments, whistles, and mouth-clicks, and a lyrical sensibility both intelligent and whimsical. Adron plays her nylon string guitar with the casually adept flourish of a Bossa Nova maestro twice her age. This becomes more impressive when we learn that the majority of these songs were originally written when she was fifteen and sixteen years old. There’s a double-awareness in Adron’s music that eludes many songwriters; a sense of self-identity and astute observation that allows her to combine the earnest yearnings of a teenage American girl with the classic melodies and rhythms of a musical movement that began in another country, more than twenty years before she was born. Her youthful exuberance and adroit musicianship together form a style both distinctive and pleasing, but it is her rare ability to meld genre, geography, and musical epochs that reveal the true breadth of Adron’s talent. One can easily sense that this debut is but the first notable stirring of an expansive musical journey to come. 9:30 - Cross-Pollination set ft LISA JAEGGI & ADRON! !